image files from a disk into any Twain application. application without a real hardware scanner. Twain Importer Dev Must have for any Twain developer The Developer Edition of our popular Twain Importer brings necessary features making your development and test teams more effective with this scanner emulator. Every developer or tester can have a personal virtual scanner for the very low price. Smoke tests, unit tests, load tests, TDD, and much more! RemoteTwain Expand your scanner Turns any Twain compatible scanner into a network scanner. are required for Windows 7.
and continue to use your scanner. Read More... Free trial or purchase for only $29! CloudScan Browser-based capture solution! Free and easy-to-use scan application. them as colorful PDFs or TIFFs. You can even upload them to Google Docs. computers at home or in the office. will be glad to do this. Cloud Scan. Scan documents from browser! RemoteTwain. Network twain driver to connect! RemoteDesktop Twain with Windows 8 support has been released. TwainImporter Pro with enhanced PDF and Windows 10 support. One URL www.cloudscanapp.com for scanning from iPhone, Android or Desktop computer. Share your scanner with all devices in network and scan to PDF for free! 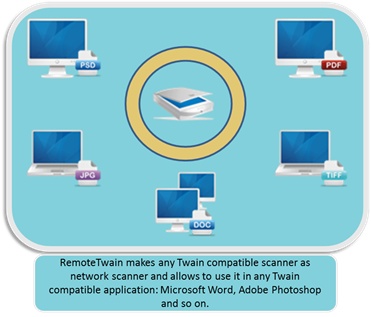 I have used ScanWorks Software Twain Importer with my customers, and it works.